Need a new mattress for 500 lb guy. Home → Pain → Back Pain → Need a new mattress for 500 lb guy. I need a new mattress. I weigh 500 lbs. I have a 9 year old Stearns & Foster one sided mattress now. I cannot sleep on it for more than 4 or 5 hours at a time. I wake up every day with back pain. I cannot go on like this. Can you help? You bet, I can help. I have a mattress that I had specially made for my larger customers. It’s been on the market for 5 years now, and I’ve already had 2 or 3 500+ pounders who own one. The mattress was designed & engineered by me, and made by Therapedic. The model name is Medi-Coil, and it is available in a firm, which is quite hard, and a plush, which is still very firm, but with a softer surface. They use the largest and heaviest coils available and are upholstered with the highest density foams. The mattress is then fully tufted for maximum stability. Quite frankly, it’s the only mattress made specifically to hold a man your size over a long term. 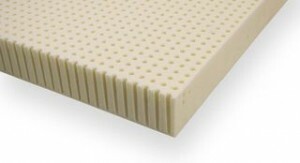 If you need top soften the surface of these mattresses, we recommend using all-natural latex mattress toppers. Here are links to the mattresses and the toppers. I have a problem … I need a 73″ long full mattress. They only seem to make 75″ or longer today. I’m replacing an old full size mattress, 73″ long. The problem is I have a built in loft bed that only accommodates a 73″ long mattresse!!! AAARGH. I wonder if you know of any mattresses today that are 73″long vs. newer ones at 75″long. I don’t have the money to hire a good carpenter to shorten my built in loft bed. It’s not a stand alone type. I dread having to settle for a shorter twin mattresses. Is this hopeless? Or do you know of any mattresses (don’t need the base) 73″ long?